There are no silly questions… if you can’t find an answer to your question using the tools below, please contact us and we’ll do our best to assist you. What can you tell me about your food and menus? Jenny Craig menus model the three key factors for healthy eating: balance, variety and moderation. The delicious Jenny Craig meals and snacks are specially formulated to support your weight loss goals and incorporated into nutritionally balanced menus planned by our team of Accredited Practising Dietitians. The Jenny Craig menus include both Jenny Craig foods and additional items you can choose from your supermarket. By incorporating a few everyday foods, you’ll learn how to create balanced meals. Once you reach your goal weight, your personal consultant can help you transition from our Jenny Craig menus to creating your own healthy, nutritionally balanced menus. By transitioning off the Jenny Craig foods and applying the healthy habits you’ve learnt from the program, you will be well equipped to manage your weight in the long term! Do you have vegetarian menus? Yes! We’re pleased to provide a good variety of delicious vegetarian meals on our dietitian designed, easy to follow, vegetarian menus. Do I have to buy your food? Yes – initially. The Jenny Craig foods are portion-controlled, nutritious and packed with flavour. 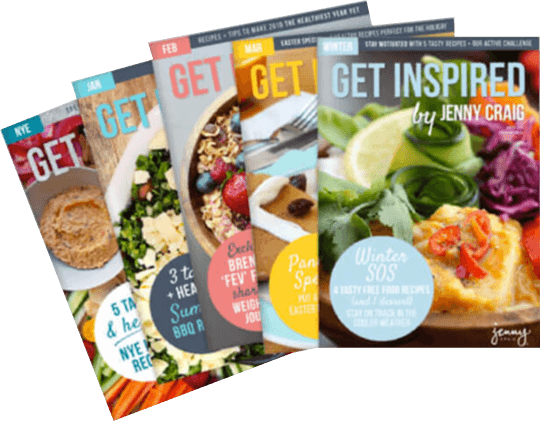 The Jenny Craig menu is easy to follow and supports healthy weight loss while building good eating habits for successful long-term weight management. As you reach halfway to your goal weight, you’ll begin planning your own menus including your own foods. Can I have caffeinated beverages on the Program? Yes, we understand that many people enjoy coffee and tea. Your Consultant will help you include some caffeinated drinks in moderation as part of a healthy diet. Can I eat out at restaurants while I’m on Jenny Craig? Yes, the Jenny Craig program is designed to be personalised to support your lifestyle. Your personal Consultant can help you make healthy choices out of the home while continuing your weight loss success on the program. Can I still enjoy meals with my family and friends? Absolutely! Family meal times are a very important part of our lives as is eating with our friends and there is no reason why they should be avoided while on the Jenny Craig program. Your Consultant will help you with recipes and strategies so you can still eat and enjoy foods with your family and friends without feeling isolated or excluded. Will I have to give up alcohol? Many things in life can be enjoyed in moderation. Alcohol is high in kilojoules, so during weight loss it is recommended that alcohol intake is limited to support optimal weight loss results. Your Consultant will be able to work with you and provide strategies to manage your intake. Do you have Kosher menus? Currently, none of our Jenny Craig meals or snacks are Kosher certified. Do you have Halal menus? We do not have Halal menus, however some members who require Halal foods choose to follow our vegetarian menu. Our vegetarian menu does however contain animal derived ingredients such as dairy, eggs and rennet so it will depend on your individual needs as to whether it will be suitable for you. If you feel we can accommodate your dietary needs, we welcome you to make an appointment to see one of our Consultants at your nearest Jenny Craig centre.